Windows 8’s built-in antivirus program, Windows Defender, constantly runs in the background, automatically scanning everything that enters your tablet. If Windows Defender detects something dangerous trying to enter, it quarantines the bad guy before it can do any damage. From the Start screen, slide your finger up from the screen’s bottom edge to reveal the App bar. Then tap the All Apps icon. 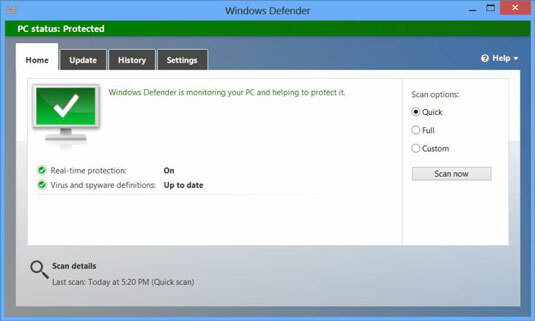 Tap the Windows Defender icon, listed in the Windows System section of apps. Tap the Scan Now button. Windows Defender performs a quick scan of your computer, concentrating on the locations where the evil beings usually try to enter your computer. Windows Defender normally updates itself daily as part of your computer’s automatic maintenance tasks described earlier in this chapter. But to make sure it has up-to-the-minute updates, tap the program’s Update tab, and tap the Update button. When you’re feeling extraordinarily suspicious, scan your entire computer. Tap the Full option, and then tap the Scan Now button below. That scan takes longer than the default Quick Scan but it’s much more thorough. To scan a portable drive or flash drive, tap the Custom button, and then tap the Scan Now button. A window appears, letting you tap your portable drive from a list. Tap the OK button.